Calvin Becerra is a former Royal Black Diamond with Mona Vie. He is currently a Double Diamond with Jeunesse Global. When Jeunesse acquired Mona Vie he transitioned his team to the new company. He is a young guy, probably in his mid-30s, and he lives in California with his family. Since joining the industry about 10 years ago, he has achieved phenomenal success. 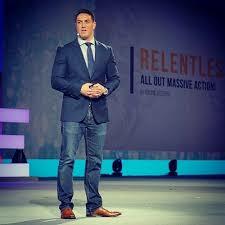 From what I recently read online, he now earns more than $200,000 per MONTH with Jeunesse, making him one of the top 100 earners in the entire network marketing industry. I would consider him the ultimate network marketing success story. Here are a few quick things about Calvin Becerra. What I like about Calvin Becerra is that he is really a people person. He has a nice personality and is very friendly and kind. He’s self-motivated and extremely successful, but humble. He doesn’t come across as arrogant or cocky. I’ve been following his teachings for about five years now and I really admire and respect him. To be honest with you, I’ve learned a lot from the guy. Calvin is very active on YouTube and Facebook live. He provides training for his team and for people in the industry, outside of his team. Here are a few of his training videos that I really enjoyed. Whether you are on his team or not, you can learn a lot from studying this guy. The name of his team with Jeunesse is Team Momentum. His business has distributors in more than 80 different countries and he has hundreds of successful leaders on his team. In summary, Calvin Becerra is a true network marketing professional. He is extremely successful at network marketing. He knows how to recruit, build depth, and develop leaders. If you are considering joining Jeunesse, he would be a great sponsor. On a side note, if you have ever worked with Calvin Becerra before, I would love to hear from you. Please leave a comment below to share how he helped you in the business and how you know him. And, if you’re reading this post, Calvin, keep up the great work. You’ve been one of my mentors for many years without even knowing it. He reminds me of this jock buddy I had in college. He was the top in every class, powerful, inspiring and really knew how to hold a crowds attention. People like this make great leaders because they just have what it takes to move mountains with their voice. Yeah, Calvin is a tremendous leader and very charismatic. That’s one of the reasons he has done so well. I believe there is a huge lesson in this post and through Calvin for many Network Marketers. The lesson is: you do not need to have experience or be from a certain class of people to do well in the MLM you belong to. It just takes determination and a willingness to follow the proven steps to gain success. You should not assume everything will just come overnight, but it will come if you just keep striving. We all can learn a lot from this young man. Unfortunately, most folks do not have the determination or persistence to stick with something. Yes Chuck, that is completely correct. Our world has become a “get it and get it now” world. So many people think that they can just sit on their stools and everything will just fall in their laps. Our government has not helped that mentality with all the handouts they give. Everyone of us have talents. If we use those talents and work hard….Good things will come. Don’t get me wrong, people do need help at times, but there are those who have made it a career living off the system. Lewis, he’s the youngest person in the Millionaire Club with Mon Avie, which is pretty impressive. What a gift to be on his team! Several things about Calvin really caught my attention. It is clear immediately that he is genuine, he’s good at motivating, and he is committed to other’s succeeding, all part of the leadership doctrine. His videos are great–he’s an engaging speaker, even a bit humorous, and good at simplifying things. I hope you find the success you are striving for under his leadership. I worked with Calvin Becerra for more than a year in my Mona Vie business. He was a great leader and really helped me, even though I didn’t do too much with the business. It’s amazing how much success he has achieved with Mona Vie, even though he never had experience in the industry before. Sorry to hear you didn’t get great results with Mona Vie, Ted. I agree with you that Calvin Becerra is a great leader. We can all learn a lot from him. Calvin is the man. I am on his team and really, really like this guy. He keeps things simple and really goes the extra mile to help his team. He’s helped lots of people achieve success with Mona Vie. The coolest part is that Calvin Becerra is still a really young guy. It just goes to show that anyone can achieve success with Mona Vie. So true, Lewis. I think Calvin Becerra is a great guy too.